like crushed petunias. . . This is an unusually interesting collection, finely tuned on both its human and conceptual levels, the work of an accomplished poet who can be funny, shocking, moving, and informative without losing her poise, her sense of humor, or her ultimate seriousness of purpose. 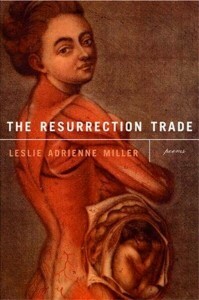 The Resurrection Trade is a revealing look at one of the ways women’s bodies have been constructed over time through the eyes of men. The book remains grounded through Miller’s writing of her present day experiences that contain the humanity that is lacking in the tinted prints she has studied.
. . . a series of elegant literary meditations on the vagaries of the female condition as refracted through the imperfect understanding of . . . male medical science.